Leander Games describe their mission as creating “great graphics, excellent animations, super exciting mathematics and hyper-attractive concepts”. The company was founded in 2008 in Argentina and have provided games with visual attractiveness as well a thrilling gameplay experiences. They develop high-quality products with unique and exciting features. Leander Games is an independent company that is looking for quicker and better gaming solutions for the current market. This exciting video slot will offer you a different way to play chess. The background of the reels is a nice blue sky and a field of grass on which the queen and the king stand to both sides of the wooden framed reel set. The reels background is chequered like a chess board and filled with chess figures. The visuals are nice and have a great detail improving the overall game feel. On the five reels and three rows you will find twelve different symbols which are all the chess figures in both colours. You will find the Kings, Queens, Rooks, Bishops, Knights and Pawns of the white and black team. The wild symbol in this game is represented by three chess pieces on a blue background. They will substitute for every other symbol to help you form more winning combinations, except for bonus symbols. You will see that the middle position of the center reel is called The Throne, landing certain symbols in this position will activate thrilling bonus features. If you land the queen in this position she will activate the Throne feature. She will go ahead to capture any adjacent pieces of the opposite colour and turn them into wilds. Your spin will be re-evaluated after this to award you with the prizes of any new winning combinations formed this way. If you land three or more of the free spins symbols, represented by two knights of both colours, you will be granted free spins. The number of free spins symbols that will activate this feature will determine how many free spins you are awarded. Three symbols will grant you 10 spins, four symbols will give you 15 spins and five symbols will award you 30 spins. Before the free spins start you are assigned a colour, if you land any piece of chess of your assigned colour in the throne during this feature it will turn all the enemy pieces within movement range into wilds and the spin will once again be re-evaluated. Remember that chess pieces move differently. 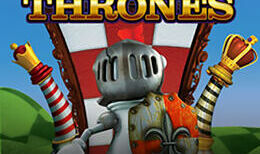 If you land the King on the throne you will be awarded another three extra free spins. The Big capture bonus is triggered by landing three of the bonus symbols anywhere on the reels one, three and five. You are taken to a different mini game where you are presented with a 5x5 chessboard. You may now pick five squares which will reveal chess pieces. The more valuable the piece you reveal the higher you reward. This thrilling video slot has 30 fixed paylines to offer and you can try a game of chess if you place a minimum bet of 30p or up to 60 pounds. Queen of Thrones offers a great variety of unique bonus features which will not only increase your chances of big wins but also add a lot to the gameplay experience. The throne is a great way to activate more bonuses. The aesthetics are very nice and the theme is a great twist to other common themes you will encounter amongst other video slots. Queen of Thrones will entertain you for sure with it’s innovative mechanics and mini games. Another Game is waiting for you, Try your luck and play the game.